TinkerBell and her fairy friends are back in an all new movie, TinkerBell And The Legend Of The NeverBeast, now available on Blu-Ray, DVD and Digital. My girls have been looking forward to the newest TinkerBell movie since the commercial started running on Disney Junior months ago. Now it is finally here, and we have big plans for family movie night this Friday night accompanied by a kids word search printable and TinkerBell coloring pages. Return to Pixie Hollow for the heartwarming and humorous adventure “Tinker Bell and the Legend of the NeverBeast”! An ancient myth of a fabled creature sparks the curiosity of Tinker Bell and her good friend Fawn, an animal fairy who’s not afraid to break the rules to help an animal in need. But this creature – massive and wondrous with glowing green eyes – is not welcome in Pixie Hollow – and the scout fairies are determined to capture the mysterious beast, who they fear will destroy their home. Fawn, who sees a tender heart beneath his gruff exterior, must convince Tink and her fairy friends to risk everything to rescue the NeverBeast. My oldest is really into puzzles and kids word searches these days. 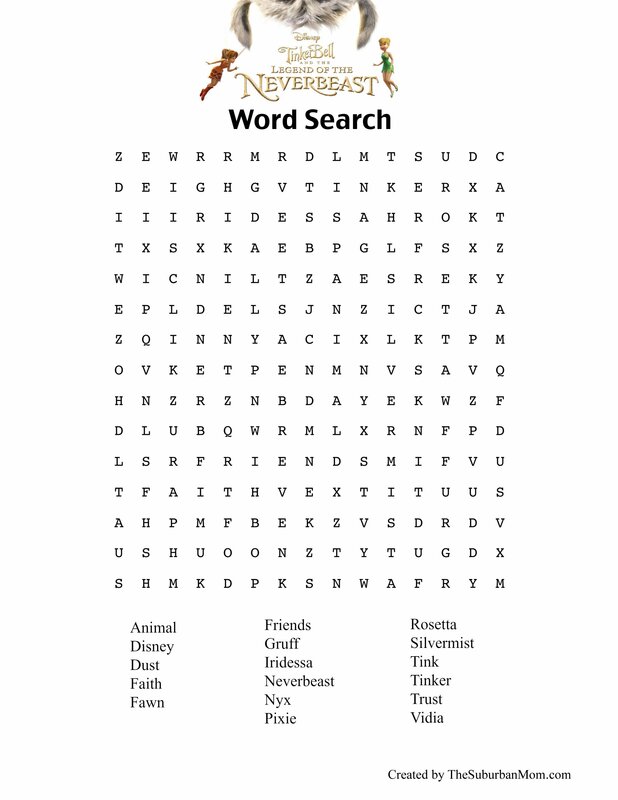 So to celebrate the new fairy movie, I created a TinkerBell word search. She liked it so much that I have plans to make her more themed word searches. In fact it was one of those, “Why didn’t I think of this sooner?” moments. To download, click the image below. When it opens in a new tab, right click on the image to save it to your computer, and then you can print as many as you need. Tip – this kids word search would make an excellent activity for a TinkerBell Birthday Party! I have always like Tinkerbell. I like the librarian of winter!! He is funny 🙂 My daughters favorite is tinkerbell! My favorite is Tinkerbell on Once Upon a Time. Who wouldn’t want to be Tinkerbell…she lives with Peter Pan and the lost boys! Tinkerbell has always been my favorite! I only know Tinkerbell, so I will have to stick with her. My daughter likes tink the best because she is always getting in situations and has to get herself out. How can you pick just one ?! Tinker Bell Is My Favorite Disney Fairy. We like Tinkerbell and Indessa, Indessa is so sweet! It’s got to be Tinkerbell. I’d have to go with Tinkerbell. My favorite Disney Fairy is Tinkerbell. Thanks for the giveaway! My favorite Disney Fairy is Tinkerbell. I like Tinkerbell the best. Rosetta is my favorite disney fairy. Thanks for the giveaway. I hope that I win. My favorite fairy is TinkerBell, of course! Why, tinkerbell of course! She’s my favorite. The blue Fairy from Pinocchio! We like Zarina the pirate fairy! Tinkerbell is my favorite. I don’t know much about the other fairies though! I really need to watch the other movies! I think that tink is the only one I know about! Our favorite Disney fairy is Tinkerbell of course! My nieces love her. My favorite fairy is Tinkerbell, Thank you! Tinker bell is our fav! I don’t know of too many Disney fairies. I would have to say Tinkerbell. For fairies, I only know Tink, but for the princesses my favorite is Pocahontas! Tink has always been my fave. My daughter loves her too, she dressed up as her for Halloween last year! I love the fairy with the attitude and the sweet innocent (yeah) smile – TinkerBell is the girl for us. My favorite Disney fairy has always been Tinkerbelle. my favorite one of ll is Tinkerbell !! !